ATDB • View topic - Bus not driving properly?? 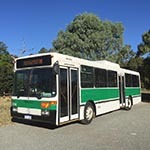 I have a 1986 Denning old Brisbane city bus. This is going to sound ridiculous but what am I doing wrong? When driving the bus I have to put full force on the acceleration pedal for my bus to move.... which is causing a lot of white smoke. I'm clearly not doing something right. What am I missing? Re: Bus not driving properly?? What are your brake circuit air gauges reading when you depart? Sounds to me like it may be an MAN SL200. You need to wait for the brake pressure gauges (the left top and left bottom gauges with 2 needles in them) to raise to at least 8 bar, before you attempt to release the spring brake. This can take up to 5 minutes, depending on how good the air lines and compressor on your bus are. The white needles tell you how much pressure is in the tanks & the red needles tell you how much pressure is being fed to the brakes, when the brake pedal is depressed. Does it have an exhaust brake? Sometimes these stick on and give the symptoms you have described.